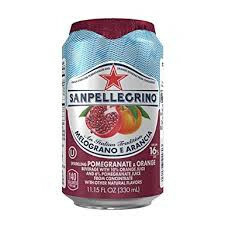 San Pellegrino Melograno eArancia Pomegranate and Orange is made with the delicious juices of orange and pomegranate. San Pellegrino Melograno e Arancia blooms with a bouquet of gently squeezed orange juice tainted with the exciting scent of glamorous pomegranade. San Pellegrino Melograno eArancia - Pomegranate and Orange has a glistening rosey-red and light effervescence of Sanpellegrino Melograno e Arancia is lust at first sight.